Walking the Walk: Can ideas42 Team Members Truly Disconnect? Happy New Year! We hope you were able to take some time off at the end of 2016, and that your 2017 is off to a good, fresh start. At ideas42, our team puts in hard work applying behavioral science to social problems throughout the year, so we close our offices between Christmas Eve and New Year’s Day to give ourselves a much-needed break to rest and recharge. Of course, we’re also working with the Robert Wood Johnson Foundation and the Better Life Lab at New America to design behavioral solutions to workplace stress and work-life conflict, so this year’s holiday break presented a great opportunity to see if our own work habits are conducive to healthy work-life balance. How did we do? Well, judge for yourself below. Before we dive into it, it’s worth noting that email behavior isn’t a perfect proxy for the amount of work that gets done at an organization. In fact, it’s one problem with the modern workplace: too much time spent emailing and not enough on “real work.” But, emails are a concrete, measurable behavior, so they’ll have to serve here. To get a better understanding of what exactly our team was up to, we downloaded ideas42 server logs for each day of our office-wide break (Friday, December 23 through Monday, January 2). We then used the logs to try to understand how ideas42ers were using this time away from work. For purposes of comparing the traffic rates to a normal workday, we also downloaded the server logs for Friday, December 19th. Before analyzing the logs, we filtered them for duplicates (for example, an email sent to one team member and received by another generated two records) and dropped emails automatically generated by other activity (such as calendar invites, or out-of-office replies). The goal was to examine only emails generated by a person actually typing a message to others, which came out to about 3,000 emails. Since we chose December 19th as our comparison day, we’ll call that day’s email volume 100% email capacity. 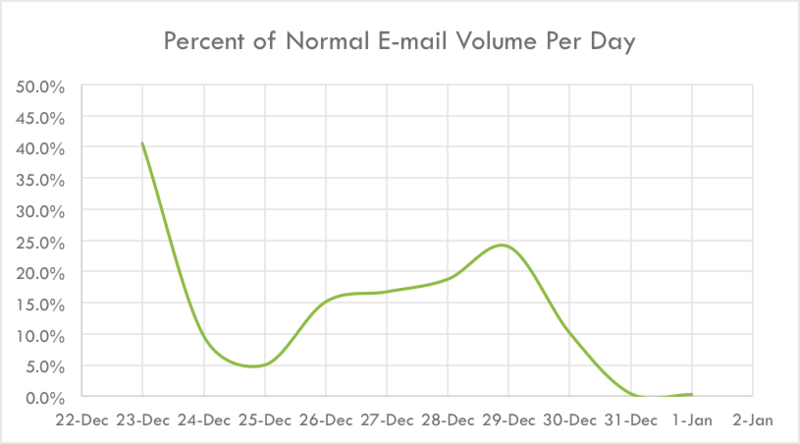 On December 23rd, the first day the office was closed, ideas42 still sent 40.5% of our normal email volume. It’s a reduction for sure, but not great for a day off. It’s possible that on the 23rd we were just trying to tie up loose ends before truly disconnecting, because the weekend looked better–Just 15% of our normal daily volume of email traffic occurred across Saturday and Sunday. The most interesting findings came during our full work week (Monday-Friday) off after Christmas Day. The email load actually rose from Monday through Thursday, only to decline sharply as we approached the New Year (see graph below). While we on the work-life conflict research team would prefer that the email frequency flatline at zero, we suppose that the dips over the holiday weekends are a good start. What should we take away from this? The ideas42 team, being quite the behaviorally-informed group of people, sent several timely reminders in the days leading to the break about the office closure, and yet overall we didn’t fully disconnect. Still, the fact that our team was supposed to be off seems to have at least greatly depressed email volume, so we should count that as a small victory. It’s also worth mentioning that we didn’t lock people out of the server – we trust peoples’ judgment on whether they need to be working. Ultimately, it seems we have more to learn about how to foster an environment that truly encourages people to disconnect. Stay tuned as we uncover more insights in our work-life balance project with the Robert Wood Johnson Foundation and the Better Life Lab, and strive to design behaviorally-informed solutions in the months ahead.